Becky Baudouin was devastated when she learned of an inoperable tumor on her mother’s lung? Her fear triggered an alarm, followed by apprehension and anxiety. 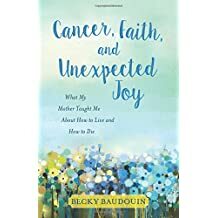 In her book “Cancer, Faith, and Unexpected Joy” Baudouin relates stories from her childhood, and expresses her fears and insecurities at home, in school, and in her relationships. She tells of how, as a teenager, she became a follower of Jesus and the impact this has made in her life. A central theme of lessons learned from her mother is beautifully woven throughout the tapestry of the book. Each fast moving chapter is filled with faith building examples and scriptural promises. “Cancer, Faith, and Unexpected Joy” is an important and meaningful resource for anyone experiencing suffering or facing the uncertainties and grief brought on by a terminal illness.